Thanks to grants from the Adelard and Valeda Lea Roy Foundation, The Braitmayer Foundation, CHT Foundation, Dominion Foundation, Island Foundation, Motorola Solutions Foundation, Rogers Family Foundation, Sounds Conservancy, and Towards Sustainability Foundation, the Lloyd Center held its Second Annual SouthCoast Biodiversity Week, ending with a Family Fun Day and Biodiversity Week Wrap-up on Saturday, September 28. These foundations not only support the Center’s Biodiversity Initiative, but also the Center’s Climate, Science, Learning Project as well. Over 100 visitors came to the Lloyd Center on Saturday to see some of the reptiles, amphibians, insects and wildlife that inhabit our watershed. 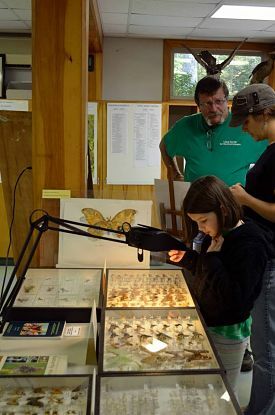 The day was filled with free guided building tours, trail walks and guided hikes, the opportunity to meet live animals, observe tank feedings, view biodiversity animal exhibits, participate in Monarch tagging in the Center’s butterfly garden, dip netting and seining at the estuary, scavenger hunts, face painting, crafts and games for all age levels. Thank you to Silverbrook Farm & the Southcoast Energy Challenge for celebrating with us on Saturday. See great photos of the day of fun & learning here!